This gallery has shots from the second part of my trip to West Virgina and focuses on shots in the New River Gorge area. Shots from the first part of the trip are in the Babcock State Park Gallery. This gallery begins with shots of the 3,000 foot bridge over the New River Gorge, 4th longest single arch span bridge in the world. Completed in 1977, it cost $37 million and cut crossing time from 45 minutes to 45 seconds. This is the bridge that closes the 3rd Saturday in October each year for "Bridge Day." 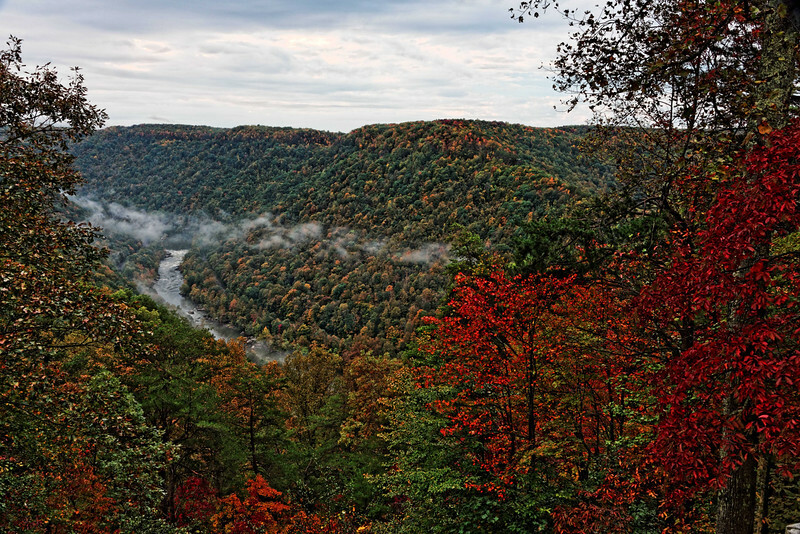 There are a number of shots from other places in the New River Gorge National River, as the park is called. The town of Thurmond is a "ghost" town, population 6, but in the 1920s and 30s it was a lively place. Several downtown buildings stand empty as a reminder of the town's better days. I also visited Hinton, WV, a real WV railroad town, population 2,700. At one time it was the western end of the railroad, and the McCreery Hotel, built 1907, was a happening place, even having Presidents stay there. Amtrak stops 3 days a week at the station, which is under remodeling. There are also several shots of the 1,500 foot wide Sandstone Falls on the New River, north of Hinton. The Falls are 10-25 feet high and span the full width of the New River at that point.